As is customary, I like to do a short post on 22 September, which has been World Rhino Day for the last few years. As this post goes live, I am on my way to the Masai Mara for a Wild Eye Great Migration photographic safari which I am hosting with Marlon du Toit. Here's a photo of a Black Rhino I photographed in an undisclosed location. This particular youngster was very agitated and charged everything in sight, even the poor Plover flying in front of him. 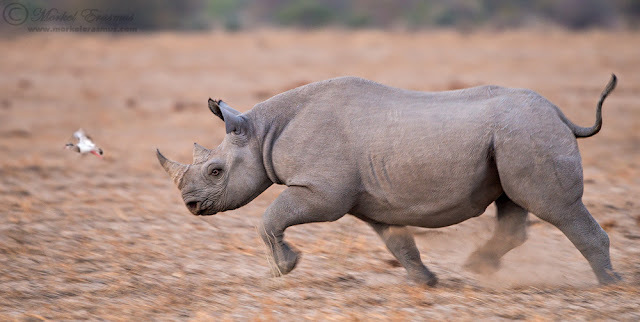 The various rhino species in the world are under immense pressure due to an increase in wealth in Eastern nations like Thailand, Vietnam and China where the horn is used in traditional medicine and ornaments. The horn has absolutely NO medicinal value or properties! We can only hope and pray that this magnificent species can one day be seen in the wild by our children and their children. If you know people who are consumers of rhino horn, please try and spread awareness of these issues to them. I doubt many of them know HOW the horn is harvested, and that it's useless for their health.